Omari George is among the most highly decorated instructors in the state of Georgia. Omari brings more than a decade of experience training with the greatest combat experts in the world. At the age of 14 he began training under the tutelage of Renzo Gracie and his world-class staff in Manhattan. Due to his talent he was allowed to train in the adult class where he would learn from high-profile names such as Professor Rolles Gracie, Igor Gracie and Jose “Zed” Chierighini. Eventually Omari would begin training under Professor John Danaher who coaches UFC champions such as Georges st-pierre, Chris Weidman, Frankie Edgar and more. At the young age of 15 he recieved his blue belt from one of the hardest instructors to achieve rank from. Omari then began training under Guided Chaos founder and forensic homicide detective John Perkins. He also began working closely with Senior Guided Chaos Instructor Lieutenaut Colonel Al Ridenhour. As a marine Lt. Col. Al Ridenhour had multiple tours in Iraq and was a liason officer for the WarLab in Quantico Virginia. Under these men Omari would receive the honor of becoming one of the youngest instructors in the organization at the the age of 19. He recieved his first degree black belt at 17 and his third degree black belt at 23. 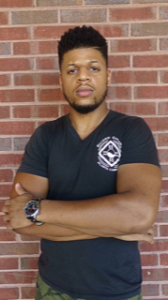 Omari is the only Guided Chaos Combatives Instructor in the Georgia area. This makes his knowledge invaluable and is the reason why people travel so far for the unique opportunity to work with him. Contact: Contact us today to schedule your free intro class!